Do you know what to do when you hear those words? How many of you can recall what you were taught in elementary school should you find yourself on fire? And how many of you have a fire safe home? Well, not everything is 100% fire safe, but there are steps you can take. In light of the fact that this week, October 6th-12th, is National Fire Prevention Week I thought I would take a moment to go over and maybe even remind some of you parents out there what you should be teaching your children. The NFPA (National Fire Protection Association) suggests you follow these 6 basic tips to ensure that you and your family are safe. 1. Be prepared with necessary tools. Do you have smoke and carbon monoxide detectors? If not, then invest in some. If you do, are you testing them at least once a month? I have to admit that I’m not completely following the “testing” protocol, so it’s nice to have a reminder. A great way to do that is to make a day each month as a special day for testing the detectors. Set it up as a reminder on your white board, bulletin board, refrigerator or whatever you may have. Involve your children in the testing and use the opportunity to go over the importance of fire safety. What a great learning experience and you don’t want to waste those opportunities. Also, batteries should be replaced at least twice a year. A good day for that is at the start and end of Daylight Savings Time. 2. Make an evacuation plan. We don’t have one of these right now. It’s something we need to work on in the future especially since Davey is now at the age to start understanding the importance and repercussions. The NFPA suggests you talk to your child about various exit points within his or her room as well as the house. Draw an evacuation route or build one with LEGOS or blocks, again engage your child. Teach him or her. 3. Mark a meeting point. Every evacuation needs a meeting point, whether that be your neighbor’s yard, your mailbox, or the lamppost at the corner. 4. Run the drill. Now that you’ve gotten tools, the evacuation route, and meeting point solidified, you need to run through the process to make sure there is complete understanding from all members of your family. The NFPA suggests acting out these drills at least twice a year. Role playing can be fun for children. As they get older and become teenagers, it may not be quite so fun, but what’s the point in having the process if you don’t know how to enact it in a true emergency? 5. Lead the way. Children learn by example. Why not set the standard now that you take fire safety seriously? Constantly practice safe fire measures daily. Don’t leave candles unattended. Never leave pots or pans or cooking utensils on the stove unattended or even within the reach of young hands. Store all fire starting tools safely away and make sure that all appliances are in working order. 6. Finally, you can download a fire safety check list at http://sparky.org/downloads/SparkyChecklist.pdf . Print this off and post it. Use it as an opportunity to do a walk through with your family. You can find out more about Fire Protection Safety at NFPA.org. You can also check with your local community calendars to see about events ongoing this week to help teach your children more about fire safety. Don’t let something like this slide. Your family is much too important. 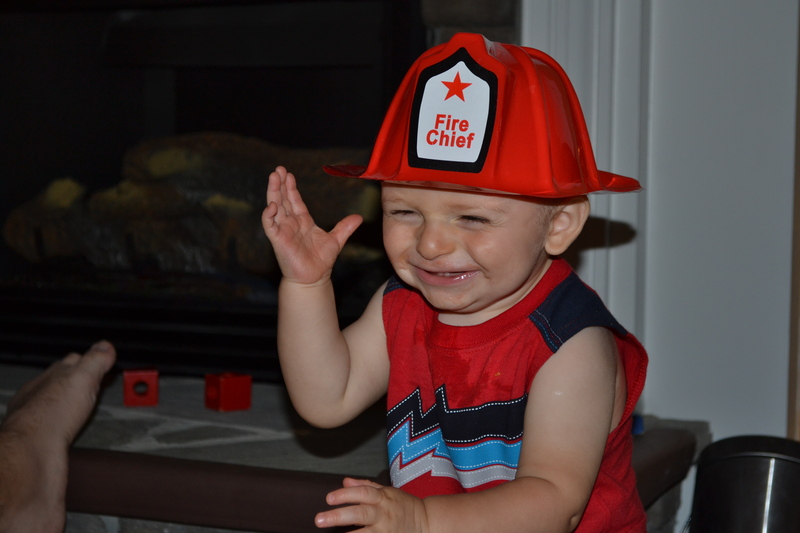 And oh by the way, here’s a picture taken of my little fire chief last year.